Attend Carnegie Council's events in person in New York City, or watch them live online; March events feature Sean McFate on "The New Rules of War" and Janet Napolitano on "How Safe Are We?" Carnegie Council is one of the world's top creators of nonpartisan educational resources on international ethics used by professionals, journalists, educators, students, and the greater public. Press passes and student tickets are available. Please contact events(at)cceia(dot)org. Janet Napolitano, secretary of Homeland Security 2009-2013. Formerly governor of Arizona, currently president of the University of California. 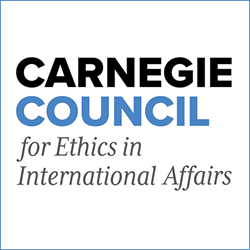 Founded by Andrew Carnegie in 1914, Carnegie Council for Ethics in International Affairs is an educational, nonprofit, nonpartisan organization that produces lectures, publications, and multimedia materials on the ethical challenges of living in a globalized world. Visit https://www.carnegiecouncil.org/.